It seems like serums are all the rage in skincare at the moment. Bee venom in particular has been referred to as "Nature's Botox", so when I was contacted by True Company and asked if I wanted to choose a product to try, I quickly selected one of their Bee Venom serums*! Niacinamide: helps the skin to retain moisture, evens the skin tone, boosts collagen production. Cucumber Extract: has hydrating and astringent properties. Hyaluronic Acid: improves moisture and softens skin. Squalane: improves moisture and elasticity. Bee Venom: said to increase collagen production and plump the skin to reduce the effects of ageing. Bee Venom is the last ingredient listed, which means that it contains the smallest amount of that particular ingredient. This may be because it isn't supposed to be used in large amounts. Even with only a small amount of bee venom, I do notice a slight stinging, plumping feeling--it reminds me of the Too Faced Lip Injection gloss, but very toned down so that it isn't painful or uncomfortable! The sensation goes away quickly and leaves my skin feeling lightly moisturized. The Accelebrite Bee Venom serum has nice, sleek packaging, though you don't get a lot of product. It has a pump (always a good inclusion!) and a nice, subtle scent. It only contains 15 ml for $79 which is more than I like to pay for a skincare product. However, compared to some other bee venom serums on the market such as Rodial and Sunday Riley, this is a good price and it does have noticeable benefits. I've been using this serum for more than three weeks now and I've noticed my skin feeling more hydrated and firm. It absorbs quickly into the skin and after it absorbs my skin feels smoother and not at all greasy or oily. 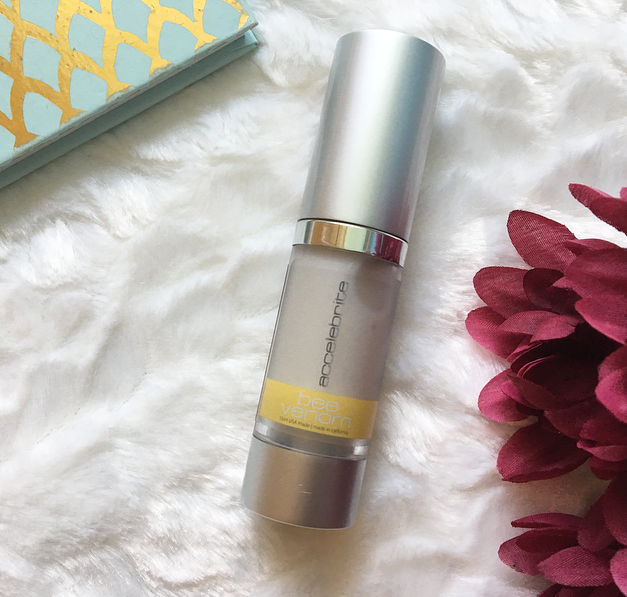 As a twenty year old I don't have many lines and wrinkles yet, so I can't attest to the anti-aging benefits this serum claims to have! If you have sensitive skin or a bee allergy, this product isn't for you, but otherwise this may be a nice addition to your skincare routine. The Accelebrite Serum is $79 for 15 ml of product and is not cruelty free (I received this product before making the decision to go cruelty-free). The brand ships to all countries, including China, where animal testing is required by law. I will continue to use this product until I finish it, but because it isn't cruelty-free I won't repurchase it. Anway, I think that if you are willing to spend the money on a serum, this is a good one to try. It is the first serum that I've ever used, but it has set the bar high for me. I'll be sad when it's gone. Have you tried a bee venom product? Would you want to? An * denotes a product I have been sent in exchange for an honest review. 10 comments on "Review: Accelebrite Bee Venom Serum"
I've heard of bee venom lip products to plump your lips but never in a serum. This looks interesting, but I certainly wouldn't pay $79 for it! I need to try this product! Do you need to go to a prom? And you want to buy a beautiful prom dress dress shops in market deeping but only to find all of these in the shops are too expensive. So come to have a look on .http://www.glamchase.co.uk You will not be disappointed.